The place of worship is at the Mosque. This is where the Muslims say their prayers. 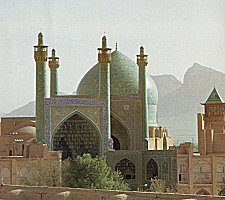 Features of a Mosque have a dome and/or a tall tower called a minaret. Before entering the mosque people take off their shoes to show a sign of respect. There is only carpet and no chairs, they are to pray on the floor. Women are to pray away from the men, this aviods distractions and to concentrate more closely on God. There is a small arch on one wall which points to the Ka'bah in Makkah. They are to pray towards that wall.